This is a great place to stay. It’s close to everything! Less than 15 minutes to Keystone, less than 20 minutes to Breckenridge, and less than 15 minutes to Copper Mountain. For shopping, it’s less than five minutes to the outlet mall shopping in Silverthorne and the City Market grocery store in Dillon. The Summit Stage bus picks up across the street so you can take free public transportation to all the ski areas. You can walk to any of several restaurants. In fact the Arapaho Café across the street has a fabulous breakfast. The condo is on the first floor, so you don’t have to lug your stuff up any stairs. (In fact, the parking is 20 feet away from the door) The floor plan is very intelligent. There are two full baths and two bedrooms. One bedroom has two bunk beds and the other has a queen. The couch in the living room pulls out to a queen bed as well. There is a dining area as well as a bar with stools. The Living Room includes a wood burning fireplace and cable TV. There is a porch swing on the porch (not for use in the winter). From the dining room window, there is a small view of Lake Dillon. The complex includes a club house with a swimming pool and two jacuzzis. There is a ski locker outside the front door. In the kitchen, there is plenty of cutlery, cooking utensils and dishes. The Dillon marina is a block away. In the warmer months, you can rent power, sail or party boats there. 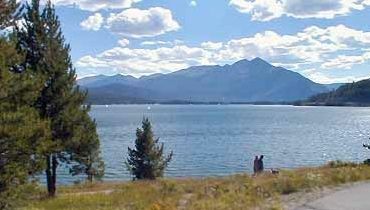 The shore of Lake Dillon is even closer than the marina. The Dillon amphitheater is even closer still. Here they have weekend concerts and Sunday morning services in the summer. A highlight for us is the bike path which is half a block away. It winds around the shore of the lake either into Keystone or into Frisco (and then to Breckenridge or Vail). You can use this for walking, jogging, biking, or just pull over some place and fish! This is a great place, summer or winter!